To be honest, I don’t like Whisky. At all. But I do believe it is something you must try in Scotland. It is the country of Whisky after all. I would prefer the latter. Not just because it involves any eating (actually yes, that is the main reason) but because you don’t have to drink that many Whisky’s if you really don’t like them. Trying any of the other options could become a bit expensive if the Whisky isn’t your cup of tea. 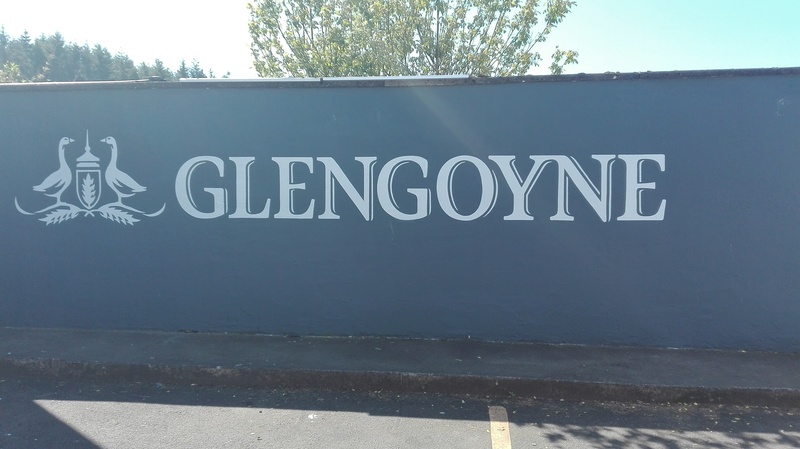 We went to the Glengoyne distillery on our trip. It was nice to see because it looked as if it came straight from a postcard. Fun fact: it is the only Whisky distillery in the Highlands. The parking lot and warehouse are on 1 side of the street, in the Lowlands. The distillery is on the other side of the road. You can guess it: in the Highlands. 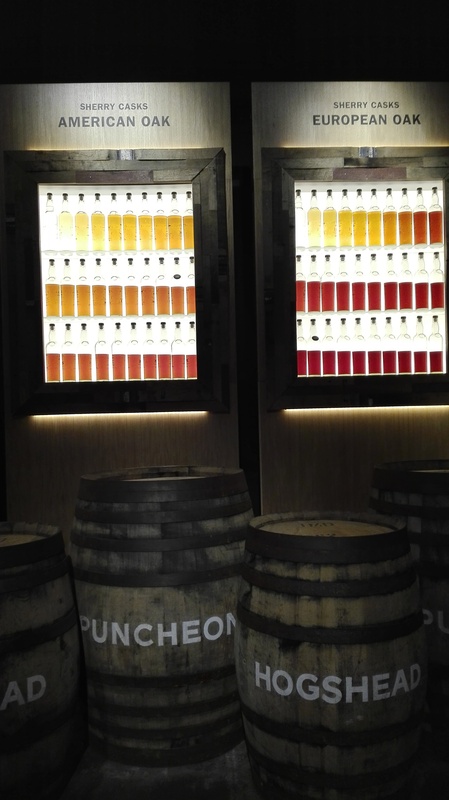 The Glengoyne Distillery had a beautiful wall which displays the loss of Whisky each year inside a cradle. It perfectly explains why older whisky’s are more expensive than young ones. 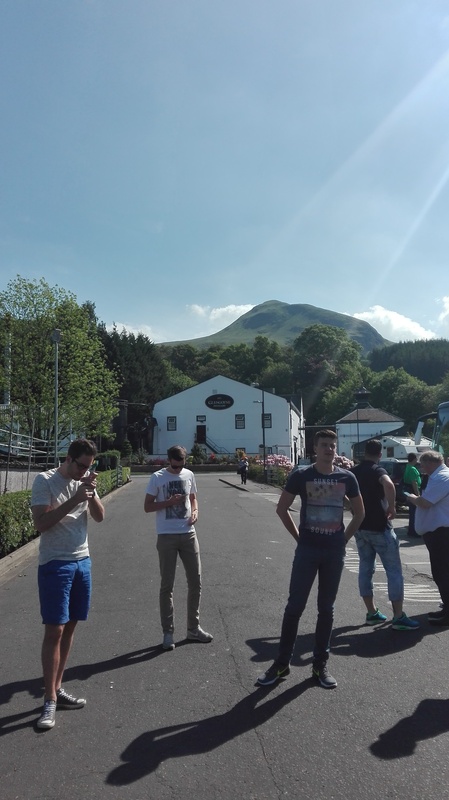 Glengoyne uses Sherry casks for their Whiskey which van be seen in the picture below. The rule for making Scottish Whisky is that it should rest inside a cradle for at least 3 years and 1 day. The Irish didn’t want to follow that rule so they’ve added the ‘e’ to their Whiskey. We went to Amber Restaurant in Edinburgh to try some of these specialities. 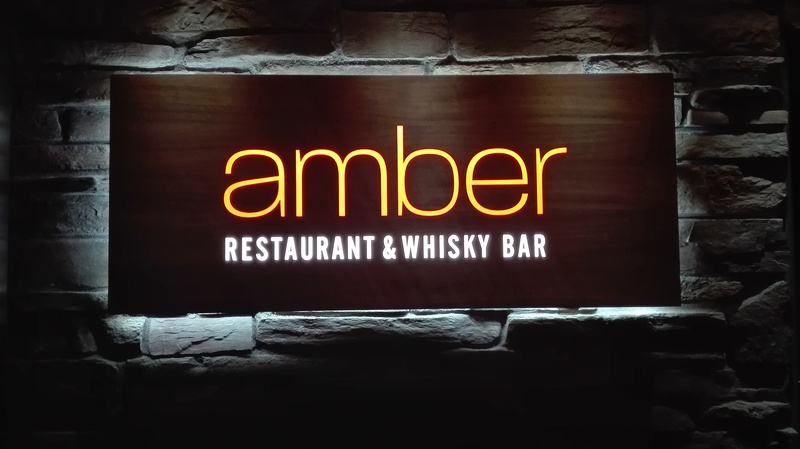 Amber restaurant offers experience tours to discover the world of Scottish Whisky and Scottish foods. 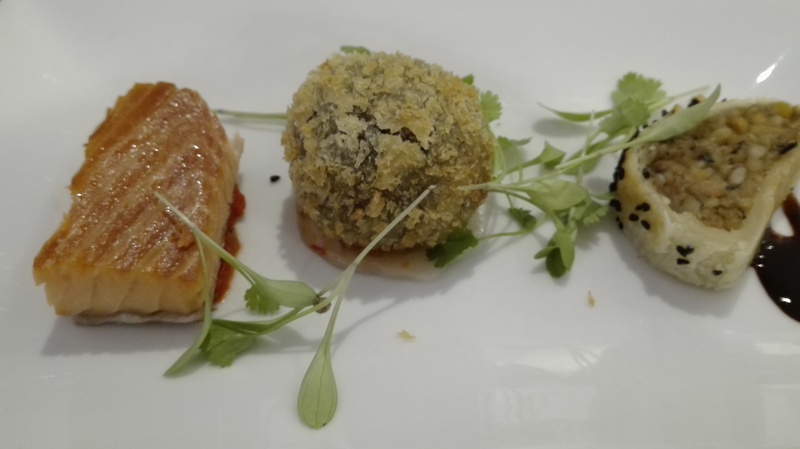 We went for “The taste of Scotland”: a three-course Scottish food experience menu. The menu started off with 3 starters: Salmon, Black Pudding and Haggis. The Salmon was really good and I loved that ball of Black Pudding (I’m a huge Black Pudding lover myself and yes I know what it’s made off.). The Haggis wasn’t really my thing but there are people who do like it. 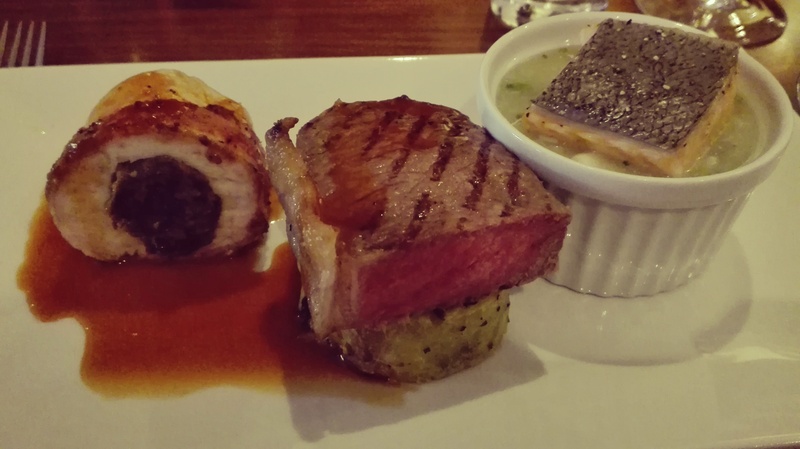 After the starters, three mains came along: Haggis stuffed chicken, steak (they didn’t say if it was Black Angus) and the typical Scottish soup named Cullen Skink. The soup was really good actually. It had vegetables, fish and potatoes in it. They usually eat it as a whole meal. I tried the chicken. The meat was soft and moist but I didn’t try a piece with haggis in it. Shame on me, I know. That steak was the absolute winner for me. Such a beautiful piece of meat. Oh and that small piece of fat on the side… Most had cut it off but it was the best part of the steak! To be honest, I would have been totally satisfied with just the steak. A bit bigger of course. I was happy to have tried the other dishes as well though. You can probably all guess what comes next 😉 Dessert! 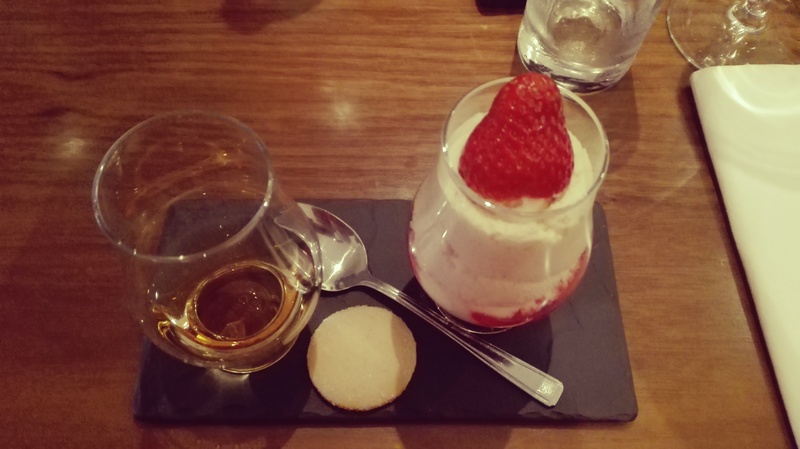 Another typical dish from Scotland: Cranachan. It’s a dessert with oats, honey, whisky, cream and raspberries. I don’t know if every type of Cranachan is this sweet, but boy it was sweet xD Only for the true sweet tooths I’d say :p Here’s a recipe from BBC if you’d like to make it yourself. If you’re staying in Scotland, your hotel will probably serve some typical Scottish breakfast as well. Our hotel served English breakfast (I LOVE the potatoes!) and Scottish breakfast. The Scottish breakfast included haggis, porridge and black pudding. The black pudding in Scotland isn’t quite the same as the one we know in Belgium. It has a different structure and also a few different ingredients if you ask me. Must-do #3: Experience the nightlife! Never thought I’d say this in a blogpost but yeah, go out! Enjoy the night and look around. You won’t believe what you’ll see. Please note I’m not in any way trying to offend anyone. What follows is just my own opinion and it is very much okay if you disagree. I’ve watched a few seasons of Geordie Shore. I’ve seen how they dress when going out. I never thought this was the official dresscode of the nightlife in Scotland. It actually started in Newcastle, UK. We stayed there for 1 night on our way to Scotland. Some of my fellow travellers went out and actually came across some of the Geordie Shore guys. Then, on our last day, we went to Glasgow, Scotland. After a splendid dinner, we decided to go and experience the nightlife. I must say, I felt a little overdressed. Not because I was wearing way too fancy clothes if you know what I mean. I was too dressed so to speak. It was incredible to watch the city come to life. Everywhere we looked, there were people laughing, dancing, going to a pub, going to a club, … The city hadn’t been silent during the day but there was a big difference with how vibrant it was by night. If you’re going to explore the nightlife in Scotland, please make sure to take earplugs with you. There were many places where the music was just way too loud. I wouldn’t want your ears to be damaged. Fun fact: apparently, everything closes at 3 AM. So no being home late in Scotland. Have you ever been to Scotland? What was your favorite place or thing to do?